The Tannoy DC8T is the middle model in the three-strong Definition range, which have very little in common with the models of the same name that were marketed in the mid-1990s. 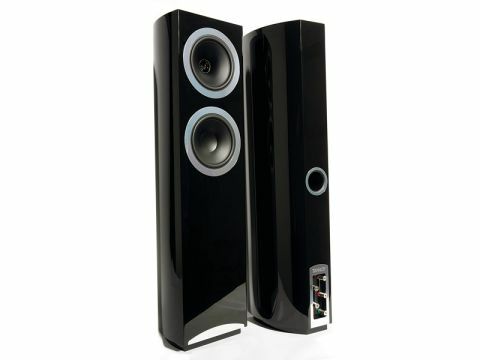 It is essentially a cross between the other two, using the driver size of the standmount DC8 within a floorstanding two-and-a-half-way configuration like the DC10T. The other model in the DC range is the DC6T. At £4,000 per pair, this is a decidedly costly loudspeaker, but it's also very substantial and beautifully built. As the name implies, 'DC' refers to the Dual concentric drive unit which covers the whole audio range, augmented by a similar size bass-only driver. The '8' refers to the size (in inches) of both drive units, while 'T' is for Tower, an Americanism for floorstander. Each 200mm drive unit has a 145mm doped paper cone. The Dual concentric driver combines the bass/mid cone with a 25mm horn-loaded tweeter that fires through the centre of the cone, so it's effectively a two-way full-range drive unit. A bass-only drive unit of similar size and construction sits below the DC unit, to ensure plenty of low frequency output. Whereas the DC10T drivers had surrounds made from heavily doped fabric, the smaller units used in this DC8T use more conventional rubber surrounds. Unlike the more costly Dimension series, the Definitions have no separate 'supertweeter', because the 25-micron titanium dome tweeter diaphragm used in this latest DC driver has a frequency response that extends to 35khz. The tweeter horn is the latest version of Tannoy's 'tulip waveguide' and, incidentally, keeps the very delicate diaphragm well away from prying fingers. The crossover network components have received deep-cryogenic treatment, which cools them slowly to around -190 degrees centigrade, then restores them equally slowly to room temperature. This process is believed to relieve stresses created during manufacturing processes to create more consistent physical structures at a microscopic level. Internal wiring is silver-plated, high-purity copper. Twin terminal pairs are fitted for bi-wiring or bi-amping, and a fifth terminal optionally allows the driver chassis to be earthed to the amplifier, reducing RF interference and enhancing dynamic range. The beautiful enclosure is very elegantly shaped, with crisp, clean contemporary lines. The silver trim around each driver and near the base dramatically contrasts with the high-gloss black finish of our samples. Dark walnut and cherry veneer (again high-gloss finished) are also available. The sides are strongly curved towards a much narrower back, so that reflections and internal horizontal standing waves should be well dispersed. A silver trimmed port in the rear reflex-loads the enclosure. The grille is held in place by magnets concealed beneath the front panel surface, which are invisible if the grille is not used (the preferred option, due to its rather hefty frame). Under the pretty surfaces, the carcass is constructed from high-quality plywood, made from dense birch grown in cold regions of the world. The bracing incorporates Tannoy's Differential Material Technology (DMT) techniques to couple the driver/enclosure interface rigidly with appropriate self-damping. A major criticism, however, concerns the floor-coupling arrangements. Floorstanders often show marginal physical stability, especially examples like these with tapering narrow backs. This is usually best countered by fitting an oversize plinth, or alternatively some form of outrigger arrangement to increase the stability footprint. The DC8T does have a plinth, but paradoxically it's under-sized, and actually reduces the footprint. As a result, the physical stability of this speaker is severely compromised and we very much doubt if it would meet the approval of the EC's health and Safety legislature. It comes as no surprise to find that the DC8T represents something of a cross between the DC8 and the DC10T. The question that needs to be asked, and answered, is whether or not the Goldilocks syndrome applies. Does the 8T manage to combine the best features of both its range-mates, as one might hope, or does it turn out to be something quite different? There are certainly similarities between the DC8 and the DC8T, as the in-room measurements reveal, though there are differences too. Obviously, this floorstander's extra bass driver adds considerably to the low frequency output – if anything a little too much perhaps, especially 40-60hz, as it also has a rather dramatic effect upon the load presented to the amplifier. The claim for 89dB sensitivity is more than comfortably met, though not that for an eight ohm load: below 500hz the impedance is mostly under six ohms and one of our pair registered a three ohm minimum at 35hz. Furthermore, weak pair matching below 60hz indicates inconsistent damping. Although there's clearly close correspondence between the '8 and the '8T through the midrange and treble, our measurements did show minor but significant differences, which had equally important implications for the sound quality. It is normal practice in loudspeaker design to balance the relative weights of bass and treble either side of the midband, yet despite its considerably greater bass output, it's curious to notice that the DC8T's sensitivity is actually rated 1dB less than the DC8 and careful comparison of our in-room far-field traces does indeed show that this DC8T has 1-2dB less output than the DC8 above 1Khz. Which in turn, neatly explains why this speaker has an overall tonal balance that's just a little too laid back and dull. The combination of a somewhat heavy – albeit agile and lively – bass and some lack of output in the presence zone does tend to dominate the subjective character of this speaker. Another key factor concerns the horn loaded tweeter, which by design restricts its dispersion to a 90 degree cone. This reduces the amount of room-reflected treble compared with the conventional direct-radiating flat baffle speakers, which results in a tighter and more precisely focused stereo image at the expense of creating 'in the room' airiness. This keeps the soundstage securely anchored to the speakers themselves and the space in between. The consequence of both these factors is a speaker that lacks some openness and delicacy, but nonetheless delivers music with a fine measure of authority and drive and which can be driven hard to high sound levels without a hint of complaint. Furthermore, those larger than average 200mm main drivers deliver an obvious bonus in generating rather greater dynamic grip and tension than is normally encountered in more conventional domestic speakers. In the final analysis, the DC8T does represent something of a cross between the DC8 and the DC10T, but under our room and system conditions it sounded a little heavy and shut in compared to the smaller model. And while it may have less coloration than the DC10T, it also lacks much of the sheer drama and excitement of the larger model.